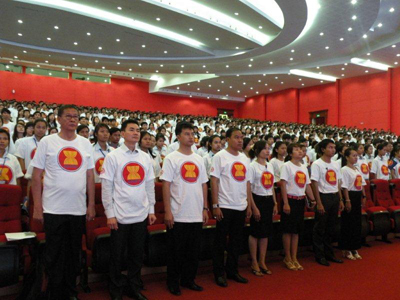 That same spirit was alive and well at Cambodia’s biggest ASEAN outreach activity last week. 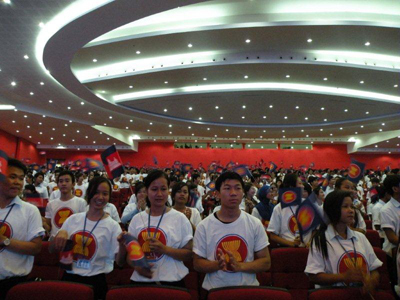 Speaking to some 3,500 students from 18 state and private universities, senior Cambodian leaders took pains to explain why ASEAN is important to the country. “ASEAN tries to promote the integration through narrowing the development gap, and benefit our ASEAN peoples—including Cambodian. It is you—as the young people—who will benefit from it, not us. We at the government level will take all effort to pave the way for our young people to grow, so it is your responsibility to decide what you’re going to do with all the benefits,” said Dr Cham Prasidh, Cambodia’s Senior Minister of Commerce. 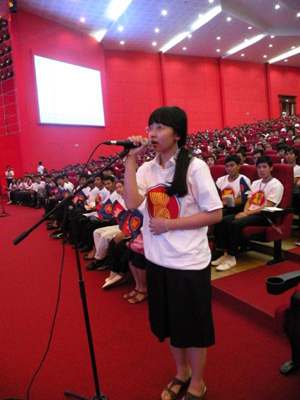 Cambodia is the chair of ASEAN this year, and the country has chosen the theme “One Community, One Destiny”. 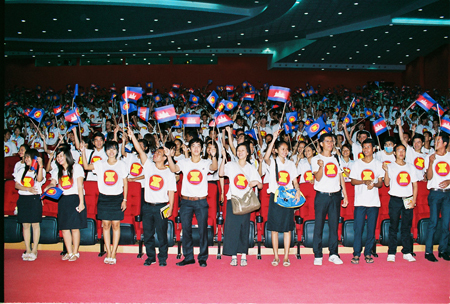 The seminar – which saw all participants decked out in ASEAN T-shirts and waving ASEAN as well as Cambodian flags – is just one of the activities aimed at connecting the people with ASEAN. 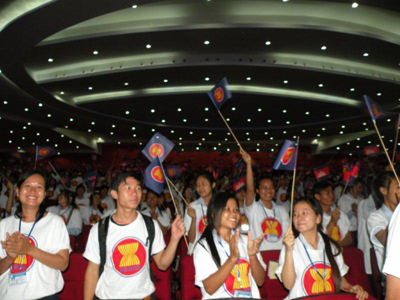 With the organization just three years away from its objective of proclaiming a community in 2015, some Member States are beginning to realize the importance of engaging the people in the ASEAN message. “ASEAN cannot be confined to just the Leaders’ meetings. We are relevant as a vibrant market, a dynamic regional economy, and a zone of peace and friendship because of our 600 million combined population. They are our backbone,” said Dr Surin Pitsuwan, Secretary-General of ASEAN. A firm advocate of ASEAN for the people, Dr Surin has been tirelessly pushing the message. Last month, the Secretary General led a team from the ASEAN Secretariat to Myanmar. With the specific objective of exploring how the Secretariat could assist Myanmar in the lead up to its chair in 2014, the team also visited two villages which were hit by Cyclone Nargis. The message was simple: ASEAN had stood by them in times of need, and ASEAN will stand by them as Myanmar rebuilds itself. This message of people outreach was conveyed to Japan last year. After the devastating March 11 earthquake, tsunamis, and radiation leakage, Dr Surin led a team of volunteers to carry the message of concern and solidarity to the Japanese victims. The team included the victims of the deadly 2004 Boxing Day earthquake – which unleashed devastating tsunamis that spread as far as Sri Lanka. Speaking from experience, the volunteers knew how their Japanese counterparts were suffering. The Southeast Asians were able to connect with their Japanese friends, which traditional diplomacy would find it hard to reach. Dr Surin is confident that people outreach will gain traction, as governments and officials see its value.